Finally done my first tube amp kit! I've built a bunch of smaller headphone amps before, but this was my first full size amp build. It's a stock k-12g tube amplifier kit with some of the mods listed here. I replaced all the stock caps in the amp section with Orange drops, I added snubber caps and connected the first and last heater pins to balance the inrush current. I had to put the tube sockets up on "stilts", thanks to James Bartlett's write up for that idea, in order to mount the tubes on the top of the chassis. I replaced the provided volume pot with an ALPS pot. I also added a bleeder resistor to the largest cap in the power supply section. The transformers are mounted on top of the chassis withe the OPT's 90 degree angles to the power transformer. The PCB is hung from the top of the chassis so that everything was attached to the top of the chassis so I could remove the bottom to do further work. All the chassis bits and parts where ordered from VT4C, I love the look, but more on VT4C later. I was fastidious about double and triple checking everything as I went so luckily it worked perfectly on first power up. And it sounds SWEET I was really worried about hum, but this amp seems to have almost negative hum... I listened to some live recordings that I love, but have significant background hiss and they almost sounded like a studio recording through this amp. I'm using a tube magic DAC in between the k12g and a sony blu-ray player and I couldn't be happier with the sound, much fuller sound with great presence as compared to the NAD 3220 I was previously using. Now onto the bad. I went with VT4C after seeing many others here have used him. I have to admit, his stuff looks great and I have no complaints about all the little bits and bobs I bought, but I have some serious issues with the chassis and transformer casings. The machining accuracy was terrible. The transformer casings weren't perfectly square so I had some issues assembling them. The whole chassis was built with terrible accuracy. Instead of drilling all the holes accurately, it seems like they just made all the holes bigger than the screws used in them. I gave up assembling the chassis like I would usually, I had to but all the screws in loosely all at the same time then tighten them a little at the time and even so there where a couple screws I just couldn't put in because the holes didn't line up and I had to do a lot of drilling, sanding, cutting and scraping to get everything to fit nicely. Not a fun job when your workshop consists of a kitchen table and a dremel tool The supplied screws and bolts where terribly cheap as well, they stripped like I was shoving fifties down their pants... I had to be VERY careful with any screws I planned on being able to unscrew later on... some of them I highly doubt I'll ever be able to take out again. Maybe I caught them on a bad day, but I'll be trying someone else in the future for buying a chassis. Last edited by DisasterArea on 06 Dec 2010, 21:51, edited 1 time in total. Very nice and nice clean look! Too bad about the manufacturing of your case components, but can't see the evidence in your photo. I really like the plates where the tubes are mounted. Slick! Thanks! Yeah, I did my best to hide all the imperfections at the back and on the bottom of the chassis. If you could see the inside it's a bit more messy as unfortunately I used math to determine where to drill the holes, but trigonometry only holds up if things are actually squares and straight lines I ended up spending way more time on the chassis than on the actual amp circuit. Way more time than I should have needed to spend. Awesome work! 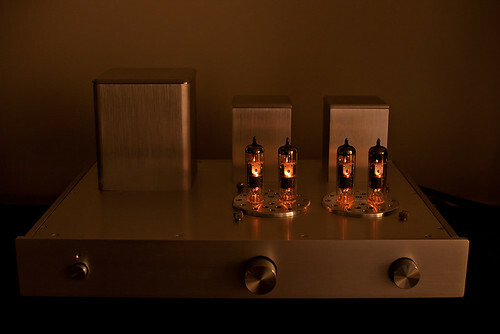 That is the best looking K-12G/M tube amp kit build I have seen. Is it ok if I place the photo on our photo gallery? 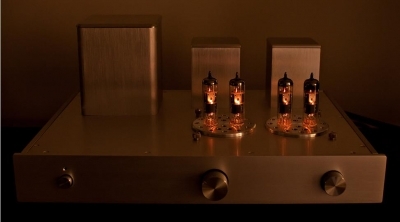 Beautiful futuristic and modern looking tube amp !! I've been building tube amps for about 6 years, probably 12 of them from scratch plus kits and repaired another 12 guitar amps, and perhaps in another 10 years I'll make something that looks that good, congrats! Wow... that's pretty high praise, thanks Like I said, I can't take all the credit for the looks, VT4C's parts do look good, but I will take credit for the hair pulling frustration of putting the damn stuff together, it was a mess. I have some better pics I'll upload later. You can't see the bottom, I used four spike feet that where intended for use on audio shelves. They're each solid steel and about the size of a golf ball. The amp weighs a TON, but even with the speakers a foot away on either side on the top of an entertainment center I can't feel any vibrations transferring to the amp. I've caught the bug now, can't wait to build another one. Trying to decide whether it'll be another S5 Kit or something else. I really wanted to build one of their 16L's with the tone adjustment module, but I've haven't heard many good reviews of the sound of that kit. One question, are their any "better" tubes that can be rolled into the k12g? I believe the 10GV8's are actually TV tubes and haven't been able to find much info on the sonic qualities of different brands of this tube. It is a TV tube and that helps keep the cost of the kits low. 10GV8 = LCL85. From what I can tell the 10GV8 and the 11MS8 (the tube that came with the K-12M kits) are functionally identical, so they should both work in the kits. The 11MS8 are getting harder to find and more expensive which I understand is the reason for the tube change.